Certain people leave an indelible mark and make us want to live, laugh, and love better. Such was the case for Mrs. Ora. L. Jones. Ora Lee Jones was a native of Montevallo, Al where she positively impacted and influenced countless individuals. Throughout her life she demonstrated sacrificial service as a devoted wife, loving mother and grandmother, and faithful servant of God. An alumnus of Prentice High School in Montevallo class of 1958, Mrs. Jones also received an honorary Doctorate of Humanitarian Degree from the Tennessee School of Religion. She was employed at the University of Montevallo where she retired after many years of labor. 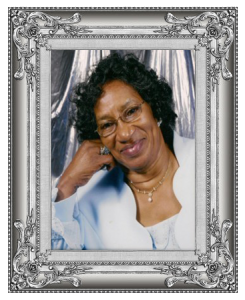 She was the First Lady of Mount Olive Missionary Baptist Church in Wilton, AL for 36 years and the former president of the Lillie Star District Association for many years. One of the most notable characteristics of Mrs. Jones was her passion for people. She was determined to reach out to and lift up everyone she encountered to demonstrate the love of God. Although she loved her family, friends, and all that she met, she loved and feared the Lord even more. She was a phenomenal lady, a Proverbs 31 woman, priceless, more valued than rubies. If ever there was a virtuous woman, Mrs. Ora Lee Jones was one. Mrs. Jones peacefully entered eternal glory on Monday, May 30, 2011. Although she is physically gone, her work continues through the legacy that she leaves behind. It is with honor that her family celebrates her memory by contributing scholarships to students and engaging in community service projects on her behalf.